"Heinz Tomato Ketchup is a classic condiment that adds extra tangy flavor to some of your favorite foods. It's prepared with red ripe tomatoes and fused with distilled vinegar to produce the rich tomato flavor Heinz is known for. Essential Table Condiment - Heinz ketchup delivers the thick texture and rich taste that you and your family love. The perfect balance of sweet and sour goes well with everything, from fries to burgers and beyond. 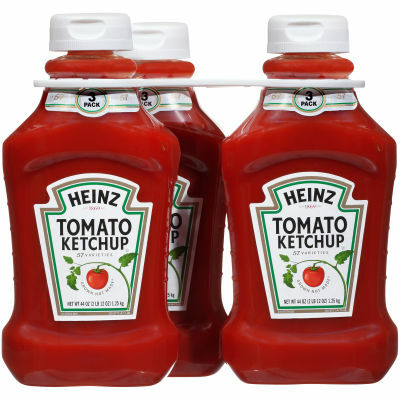 This generous 3 pack of 44 oz bottles ensures you'll always have enough tasty ketchup on hand for meals and snacks. "